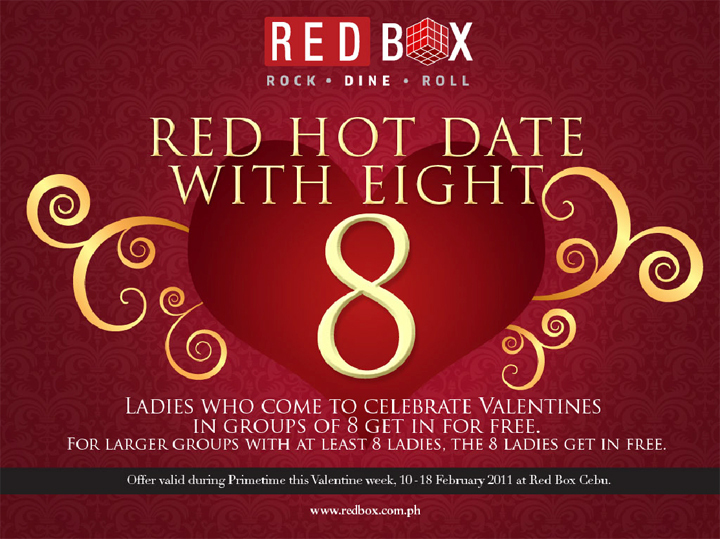 Red Hot Date with 8 at Red Box: Rock, Dine, Roll at Ayala Terraces Cebu. On February 10 to 18, 2012, Ladies who come in to celebrate Valentine’s in groups of 8 get in for absolutely FREE during Primetime (7pm-12 mn). Check out also Reb Box Cebu's ongoing Promos as well: the Cebu-friendly PhP 99 per hour is on every day and Ladies’ Night on Tuesdays. Red Box Cebu is open Fridays & Saturdays 12 noon to 3 a.m. and Sunday to Thursday 12 noon to 12 midnight. Red Box Cebu is located at the Garden Level of The Terraces (below the Active Zone, across the fountain) at the Ayala Center Cebu, Cebu Business Park. There are many things you can do at Red Box Cebu, with its innovative packages, spend less per hour at Red Box singing, playing billiard or even watching a movie. 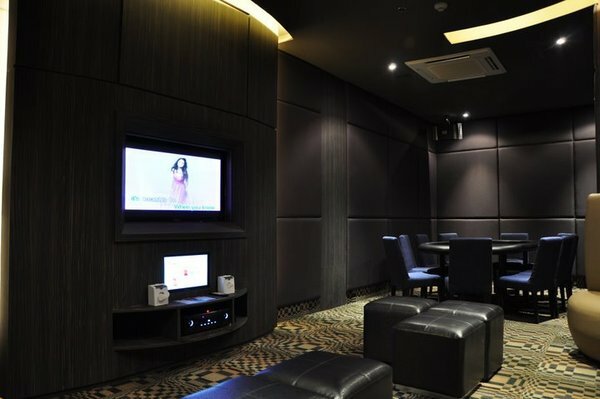 Red Box Cebu serves as your chillout lounge for recreation and hanging-out- in Ayala Center Cebu. RED BOX Cebu is a premium venue for interactive video music entertainment in Cebu. A variety of rooms with different amenities like billiards, instruments and game tables are part of its array of room options. The RED BOX experience is the complete package: singing, good food and fun times for everyone. For inquiries please contact Red Box Phone numbers (032) 417 1675 or (0917) 6233397. Visit www.redbox.com.ph for more information or find them on Facebook : Red Box: Rock, Dine & Roll. Red Box Cebu Valentine Promo for the Ladies posted at Cebu Events Blog. 0 comments: on "Red Box Cebu Valentine Promo - Red Hot Date with 8 for the Ladies"